The police cordon in Mourneview St near where a man's body was found at the weekend. INPT10-211. Eimantas Gerdvilas’ body was found in Portadown after being missing for almost one month. Mr Gerdvilas’ partner Edita Matij, clearly upset that her partner’s body had been found and that his death is being treated as ‘suspicious’ by police, had criticised the PSNI for the efforts in trying to find him. 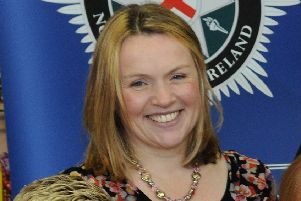 PSNI District Commander for Armagh, Banbridge and Craigavon, Superintendent Davy Moore said: “I understand that this is a very difficult time for Mr Gerdvilas’ family and friends however police worked tirelessly to locate Mr Gerdvilas, provide updates to his family and utilise every investigative lead. “Mr Gerdvilas’ was reported missing on 14 February and his partner was updated on an almost daily basis during the course of this investigation. We also contacted family members outside of this country to make them aware of the steps we were taking and how the investigation was progressing. “An investigation was launched as soon as we received the report and this was reviewed on a daily basis. We conducted searches within hours of the report and took action on every piece of information we received. Details of the missing person were circulated to every officer in our District. We checked hotels, bars, clubs, hospitals and ports. Searches were supported by air support, dogs unit, TSG and community search and rescue. We trawled through cctv from a wide variety of sources and conducted numerous leaflet drops. We also visited and searched locations that were highlighted to us as being possibly visited by Mr Gervilas and issued a number of appeals to the public. “This thorough and robust investigative work ultimately led to the discovery of Mr Gerdvilas’ suspicious death. “A Family Liaison Officer has been appointed to the family since the investigation into his suspicious death began and they are now in regular contact with the family. Queries and concerns the family expressed have been addressed through the Family Liaison Officer.